(December 19, 2009) Covina, CA. 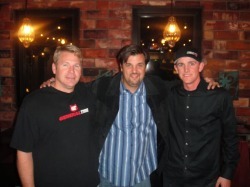 On December 14th 2009, FAST-aid was asked to share in the celebration of a very successful Baja Support Run III at Café Maiz in Mission Viejo. Festivities included; appetizers provided by Café Maiz, Azunia Tequila samples, silent auctions, and a Baja Support Run III recap video by Sinister film. FAST-aid is honored to be involved with the amazing people that make the Baja Support Run possible. The Baja Support Run was started in 2006 by a group of individuals and business partners that wanted to give back to the people of Baja. Every year the Baja Support Run tries to give more than they did the previous year, 2009 was no different. They were able to give over $8,500 in food, supplies, toys and other daily necessities to the Rancho El Milargo Orphanage just outside of Ensanada MX. 2010 brings on a new challenge for those involved with the Baja Support Run. Not only are they going to give the usual supplies (canned goods, hygiene supplies, and toys) but through some generous donations from people and businesses in and out of the industry, the Baja Support Run IV will be bringing bicycles and skateboards to the chosen orphanage of Baja Mexico. (From left to right in above picture) General Tire/Azunia Tequila/Wahoos/Blue C/Light Force SCORE Trophy Truck #13 Driver and owner Ed “Clyde” Stout, President of Blue C Communications Eric Morley, Co-founder of FAST-aid Adam Gunn.